Pet problems or funny stories? Last year around Easter time, the pastor actually brought in a baby lamb for the service. I work with sheep on a somewhat regular basis at work and I know that they aren’t the most discriminatory of defecators, especially if they are just switching to a solid diet and starting to ruminate. I admit I was a little worried. Happily for us it did not poop on the floor. It was just all cute and what not. However I just saw one of the four services, and I noticed that this year the lamb was definitely not back again. We are getting a peach-faced lovebird in October when my daughter turns 4. She doesn't know yet that's she's getting him, but she talks about birds all the time. We "visit" him frequently at Petco. She has already named him Jackson; every time she sees a bird outside, she'll say, "That's Jackson's dad [or cousin, or brother, or sister, etc.]." But sometimes when I see a bird and I say, "Hey, there's Jackson!" she looks at me with that disgustedly-patient 3-year-old look, shakes her head, and says, slowly and quietly, "No, Mommy, that is not Jackson." Duh. She also frequently asks if we can keep a zebra in the backyard. I'm not sure how to answer that, really. And she told me when she grows up she's going to live on a farm so she can have a pony, a pig, a zebra and a chicken, but that I shouldn't be sad because I can visit her any time I want so we can watch "The Amazing Race" and drink hot tea. And she told me when she grows up she's going to live on a farm so she can have a pony, a pig, a zebra and a chicken, but that I shouldn't be sad because I can visit her any time I want so we can watch "The Amazing Race" and drink hot tea. That sounds like a pretty sweet retirement to me. I would encourage it. I'm an agriculture and extension education major at West Virginia University. For the last year I have worked for the Agronomy Department as a student research assistant. Basically I do mostly farm and a bit lab work for minimum wage. One of the big research experiments we are working on is finding ways to reduce parasite infestation in organically raised sheep. In my time working with sheep I have come to realize that they are probably the most ill adapted creatures for survival on the face of the earth. One time we were unloading a group off of a stock trailer and this ewe managed to sustain a fatal injury by just jumping from the trailer floor to the ground. It couldn't have been more than one foot off of the ground. It has given me a better appreciation of all the sheep symbolism in the scripture though. They say that most domestic animals can do pretty well when they go feral. Except for sheep. They're just helpless...apparently so far removed from the wild ancestor that they can't survive. That's our fault, isn't it? 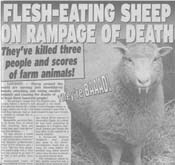 Hard to imagine killer wild sheep. ETA: I suppose it depends on what you meant by wild. If you meant crazy and uncontrollable, then yes. I am completely at a loss. I...I just...I don't know what to say. eta Wait, I've got it. Cool! Plus we all know that there were killer wild rabbits in medieval Britain. Thank goodness we got those vile beasts domesticated. After watching that several times, I've decided it's the "Mint Sauce" as a weapon that pushes me over the edge. Topped off of course by that guy's girly scream at the end. There's no way that movie can be serious. Don't forget all the Killer Tomatoes. At least frogs and sheep have eyes, as David Sedaris would point out. They are far more dangerous than viney fruit. Holy crap, I have that movie. I got it as a gag gift, and I've never actually watched it. You have to, it is quite possibly the most unintentionally hiliarious movie ever made. It says "Surprisingly scary". Think they still sell it? I like to talk about my dog a lot...which is probably lame, but I don't care. Sue me. Anyway, I was home for lunch today, watering the flowers, and the dog thought it would be wise to lay on the scorching hot patio while I did this...so I'm watering away and all of a sudden I hear her yelp a bit...she's laying on the patio, sun blazing down on her, and whimpering like crazy. I assume it was because she got too hot, but she wouldn't get up until I went over and actually lifted her off the patio. Dumb dog. I like to talk about my cats a lot, but they haven't done anything funny today. Odin may have vomited. I heard him coughing, but I can't figure out where he was. Now he's asleep in the recycling basket. My cat did a really funny thing the other day, but I'm sure upon retelling, it wouldn't be that funny. Bono (the cat, not the activist/singer/songwriter) got neutered the other day. Poor guy. I couldn't help but laugh thinking of the U2 Bono being neutered. Maybe he'd rededicate "With or Without You" to his "boys." The funniest things my dog does lately typically involve crapping in the house, although he did eat a colorful plastic necklace-type baby toy. But the funny part there involved crapping outside. It was like he crapped a rainbow. My mothers dog is a brat. She's this Yorkie who is incredibly cute, but a brat brat brat. My dog thought it would be funny to vomit at 4am and again at 6am. Luckily only one puke pile was on the bedroom carpet, since her wretching sounds always wake me out of a dead sleep so I got her to puke mostly on the bathroom floor, which is much easier to clean up. Yes, I said "always" since this happens about, oh, monthly. I realize maybe we should get the vet involved, but I'm blaming the combination of the heat this week and getting a different treat chewy thing yesterday for this particular puketastic two-parter. I still haven't fed her today...I'm afraid that if I do, she'll just hork it back up. Although I swore it wouldn't happen again, it did. We have the monster cat back in our foster care. For an indefinite period of time. Puff and Sam are not too pleased about it, although the little fella is pleased to have another animal to pet. He has eating compulsion problems and has to sleep in the garage, two floors beneath our bedroom. I frankly don't know why he complains about it. He's got food, water, litter, a comfy bed, and windshields to leave footprints on. And think of the smells! Some cats are just never satisfied, I guess. Are you referring to Little Fella or to Monster Cat?